With audio/motion-detection kicking capture into action the Arlo's built-in battery can last for a long time, ensuring peace of mind and longevity – without the necessity for pricey monthly billing costs to worry about. Sure, Google's Nest alternative is a more advanced system, but it's far pricier with ongoing costs, which is how Arlo earns its keep. Arlo has emerged into one of the best camera systems for the smart home, fusing convenience with affordability. You're not required to subscribe to a cloud storage service, while the new Smart sign-up service starts at just £1.99 per month, making it more affordable than many rivals. Arlo offers a number of different systems: there's the basic Arlo with battery-powered cameras, Arlo Pro with rechargeable batteries, and Arlo Pro 2 which offers Full HD capture. So how does that middle system perform? Installation of Arlo cameras is easy, thanks to the lack of cables. The cameras in the Arlo Pro system are slightly larger than those of the basic Arlo, but they house rechargeable batteries and offer audio detection. The design is similar, with each camera backed with a strong magnet which can be attached to the supplied wall-mounts. These simply slip over a protruding nail or screw, rather like hanging a picture, with the magnetic attachment then providing flexibility to position the camera at a convenient angle. Generally speaking they then stay put, although the cameras can move if, for example, an animal sits on them, like a passing squirrel or bird. Unlike some more permanently affixed cameras, Arlo can be easily removed, so it's worth considering where you position them: they're no use if a burglar can just knock them off without stepping into view. If you want something sturdier there is a screw mounting option, but there's still no way to lock the camera to the mount, so the same conditions apply. At the same time, the rechargeable nature means you need to be able to easily remove them for charging – unless you use the included cable, which we'll talk about in a moment. The cameras have an IP65 waterproof rating and we've found them to be fine operating in all weathers. There are accessory covers if you want to move away from the white plastic finish or to provide a little more protection. Indeed, there are many options and accessories – including third-party ones. Connecting to the Arlo Pro cameras is a new base station: the Hub Pro. You can use the base station from the regular Arlo cameras as the entire system will mix and match, but the Pro Hub is, in our experience, more stable – so it's worth the switch. The Pro base station is also equipped with a siren, which you can set to trigger under particular conditions, or you can set-off manually via the app. It's sort of like having an alarm, except it will be inside your house, rather than outside. The base station needs a wired connection to your router so that it's online, as it needs this connection to provide smartphone control and the 7-day cloud storage of captured video clips (this can be extended with Smart subscription packages – which we detail in the capture options section below). There's the option to use a USB stick for local storage of video if you prefer, entirely removing the time-limited cloud storage issue. Once you have everything out of the box, the first priority will be to the charge the cameras. There's a Micro-USB connection on the rear of the cameras to accept a cable to charge the internal battery. These batteries are removable, but have to be charged in the camera unless you buy the Pro Charging Station. Spare batteries are advisable (with the Pro Charging Station) if you have a large setup, just so you don't get caught without coverage. The Micro-USB has a fairly small opening, so you can't use old cables you might have lying around because they won't fit into the socket. Look after the cable that comes in the box, however, as we've already shredded one cable that got twisted up – it is rather flimsy. The battery life of the Arlo Pro cameras depends on a number of conditions. Because the Arlo system waits to detect motion and then records video which it relays to cloud storage, the battery life very much depends on how much activity it spots. Typically, for an Arlo Pro camera in a space that doesn't see much movement, the battery will last for months. For something in a busy area – perhaps the front of your house where it sees a lot more street movement from passers-by or traffic – this will be shorter. The advantage that this system offers over the basic Arlo system is that you can recharge the batteries. The regular Arlo cameras each want four CR123 batteries and the price soon racks up through the year if you have to change them every couple of months, so we'd rather pay more for the Arlo Pro from the outset. Alternatively, if it's convenient, you can leave the Arlo Pro cameras connected to the charger so that they're always powered. If you're monitoring a remote location like a holiday home and you're not going to be there to charge them, you might want to consider this. At the same time, there are wired cameras that you might prefer to use in those conditions (although most have monthly fees, like Nest Cam). With charge in all the cameras, you'll have to pair with the base station, using the app to guide you through the process. On initial setup this is fairly straight forward, but if you're fusing a new system with an old (we tested the Arlo Pro with older Arlo cameras too) then some things can get confused and it can take a little swearing to get things running. We've also had to remove a camera from the system and re-pair it with the base station to get it connected. Pairing the devices feels like it could be more streamlined. That said, the base station of the Pro seems better at maintaining connection to cameras than the older basic Arlo base station. This might be down to firmware advancements or it might be that it's newer and more powerful. Whichever it is, we've had a better experience with the Pro base station across all our Arlo cameras. 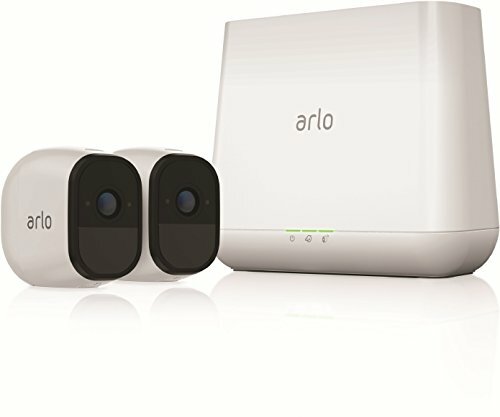 The Arlo Pro system tops out at 720p capture, so it's HD, but not Full HD (1080p). This is the same quality as the basic Arlo cameras, a step down from the Arlo Pro 2 which moves up to 1080p capture for sharper images. This isn't actually mentioned in the camera settings, instead you have option of best quality video, or best battery life, which changes the capture resolution accordingly. Generally speaking the quality is reasonable in the "optimised" setting and you can make out what's happening within the frame, although higher resolution will mean more detail – and that might be the difference between being able to see what a person was wearing and being able to see the logos on their clothing. The Arlo Pro cameras include IR LEDs for night vision and again this works fairly well for capturing the particulars of any movement when it gets dark. The illumination reaches out to about 7.5m, so it's ideal for a driveway or people approaching the house. Video capture generally looks a lot better than stills. Out of the box the Arlo Pro isn't as smart as some other systems: it detects movement of any kind and alerts. However, it can be made smarter by signing up for a Smart subscription, which will allow you to target a particular activity zone or detect and alert you to animals or people – elevating the potential of the system. In the future, via software update, thre will also be features to detect parcels left on your front doorstep or remotely call the police to come to your home. No, it's not quite as smart as Nest Cam IQ, which learns specific people thanks to face recognition, but the Arlo plans are more affordable. Smart (£1.99/month or £19.99/year) and Smart Premier (£6.49/month or £64/year for up to 10 cameras) packages take cloud storage up to 30 days, while Smart Elite (£9.99/month or £99/year for up ot 20 cameras) takes that storage to 60 days. The Arlo Pro camera also offers sound capture, which you can have to accompany your video. You can have Pro cameras rigged to alert you to audio instead of movement – or indeed both (an indoor camera will detect a window or door breaking perhaps before it captures motion). They also include speakers so you can talk through the camera via the Arlo app. What triggers the camera's detection is totally customisable through the Arlo app and you can setup a range of different modes and subsequent actions. You can, for example, have video captured whenever motion is detected, you can opt for email (to multiple email addresses) or push notifications (or both). It's a really flexible system. There are a couple of presets you can use – geolocation to turn on monitoring whenever you leave the house, or on a schedule, so that it arms whenever you leave the house for work, for example – but being able to specify what you want to happen under what conditions is really useful. Push notifications are good if you're always in an area of good reception, but we like the emails more. The advantage they offer is that they send through a thumbnail image. One of the reasons we like those emails is that the app needs a good connection to give you access. We've been alerted when away from home in areas where reception is poor and found that logging into the app can fail when you have bad reception. That's irritating, because it will then cancel out your login details and ask you to sign-in again, unless you completely shut down the app and open it again (on Android at least). You can use fingerprint unlocking, which makes things smoother. The Arlo app has had a redesign in 2018, so it looks smarter than previously. It's not as smart as the Nest app and you don't get the same sort of timeline views that Nest will offer you – but you don't have to pay for an ongoing subscription if you choose the basic option. Video that's captured is available to download and save, but it is otherwise in the cloud for a week (or 30/60 days with relevant Smart subscription package). That makes Arlo a cheaper system to run than many others. We've got five Arlo cameras in the system and there's no ongoing cost, or it'd cost us £64/year for 30 days cloud storage and more intelligent recognition – but even choosing to not have that pay-for package gives us a week of cloud storage at no cost, which we're very happy with. See how different systems compare in our round-up of connected camera systems both indoor and outdoor. Arlo Pro betters the more basic Arlo system with rechargeable batteries, avoiding the potential costly nature of constant replacements. The Pro doesn't provide video quality that's as good as the Arlo Pro 2, but it still sits in a great middle ground. When you consider everything it offers, Arlo Pro makes a great starting point for building a flexible home security system. With its modular design, it's easy to expand to other products in the selection – so you can add different types of Arlo camera in different places – without the nagging concern of ongoing costs. And should you choose a Smart subscription package then the system adds more advanced detection and longer cloud storage from just £1.99/month – making it far more affordable than many of its competitors. Google's own setup is robust and has the best-in-market detection for faces and familiar persons. However, it's pricey to purchase from the off, while the ongoing subscription costs are its biggest consideration. But as the tech goes, there's nothing better we've used to date.